It was May, life was good and I was on the computer as usual trying to get out of doing some kind of housework. I scan my emails and see Better Homes and Gardens, oh just another magazine subscription. Reading a little further I realize they’re inviting me to Iowa, to tour their headquarters and to visit the exclusive Style Showcase filled with beautiful BHG products available at Walmart. A couple of things went through my mind, as you can imagine. I won’t go into the…lose weight, buy new clothes, wrinkle cream…’cause none of that happened. And that’s how it all started. The me+them partnership. The me getting to see cool stuff that I know you’ll love, affordable stuff! 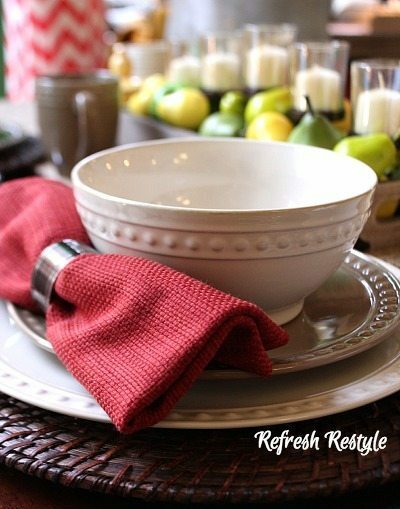 Over the next few months I’ll be sharing my design tips and tricks, sponsored by BHG at Walmart and I’ll be using more of their wonderful products! 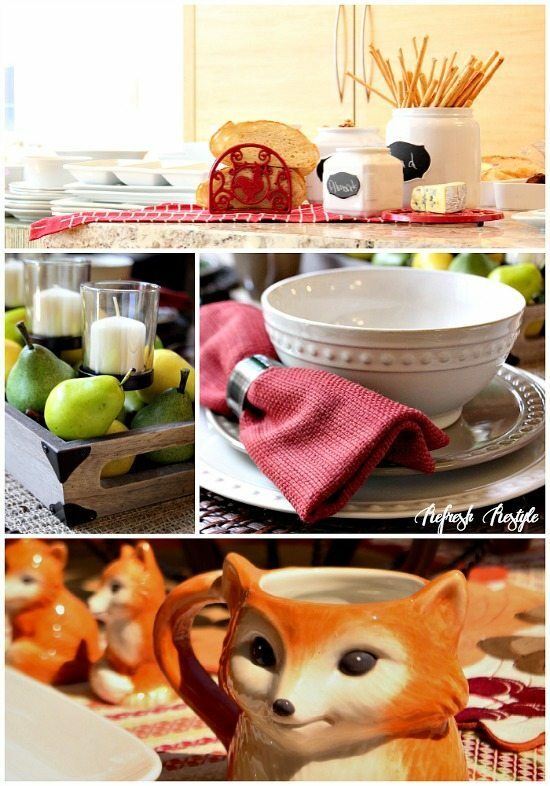 Ok, tell me these tablescape options are the cutest things you’ve ever seen! Love the idea of using those chalkboard canisters as serving pieces! Farmhouse Luxury. That’s what Max called it and that’s what I’m calling it! They have an entire collection in this awesome finish, Better Homes and Gardens Crossmill Weathered Collection in Lintel Oak. 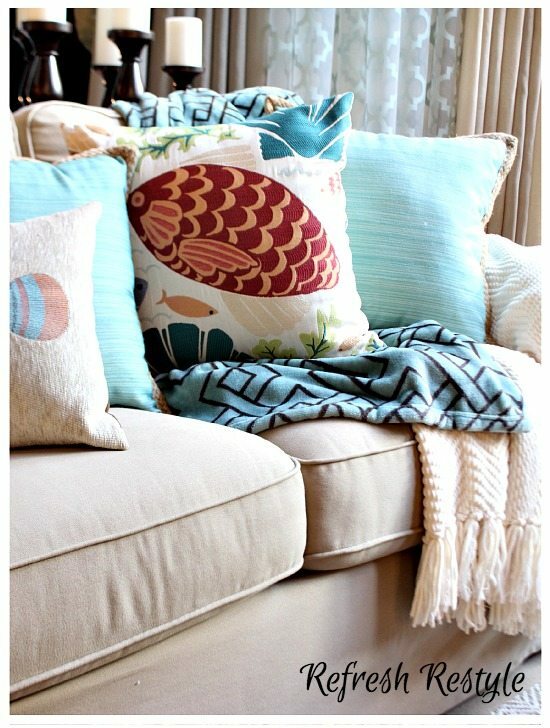 If you’re the touchy-feely type, you will love these throws and purry, I mean furry pillows. Don’t get me started about their awesome dinnerware! Available in stores in September, can’t wait! 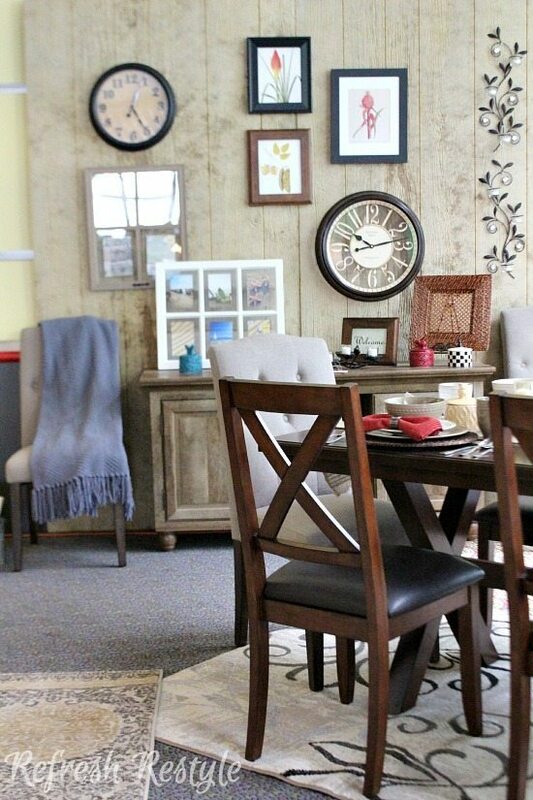 Did you know that you can order slipcovered furniture from walmart.com, you can! 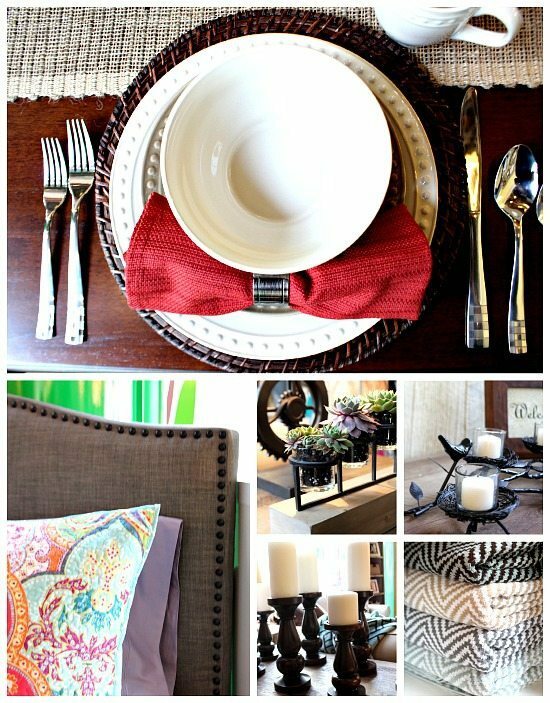 Nailhead trim is all the rage, from dinnerware to headboards. Candle holders galore some restyled to hold succulents, some with bird nest and these plush zig zag/Chevron towels (Towels will be out in the spring, keeping it FRESH). 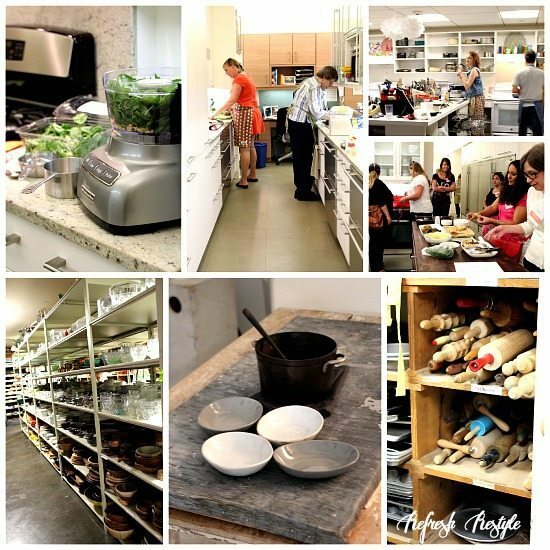 These photos are from the photo shoot area at Better Homes and Gardens headquarters. Learning tips and tricks from the pros. Moroccan sweet dreams in this bedroom and yes, it’s all from Walmart. 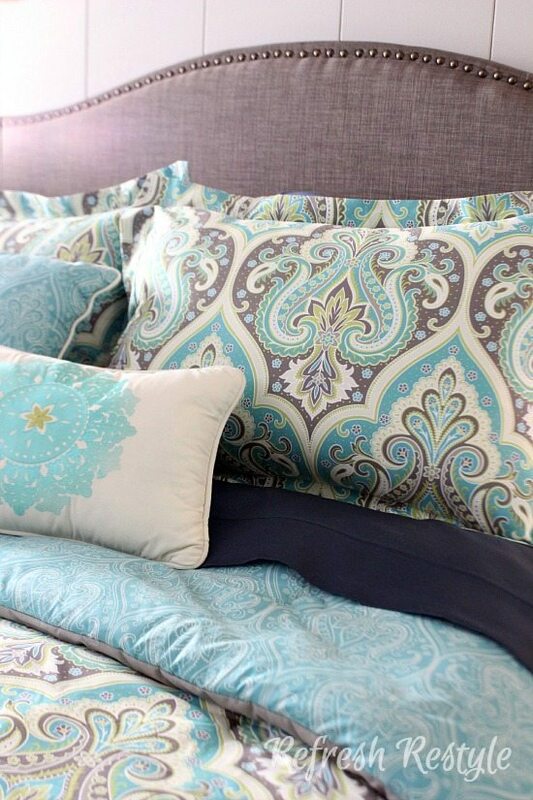 Bedding will be available in September, in the store and online. The Moroccan Mirror is available in the store! Priced at around $15! Mix and match, navy sheets with the ensemble. I need that headboard and for only $149 and it comes in King size too, for $219! 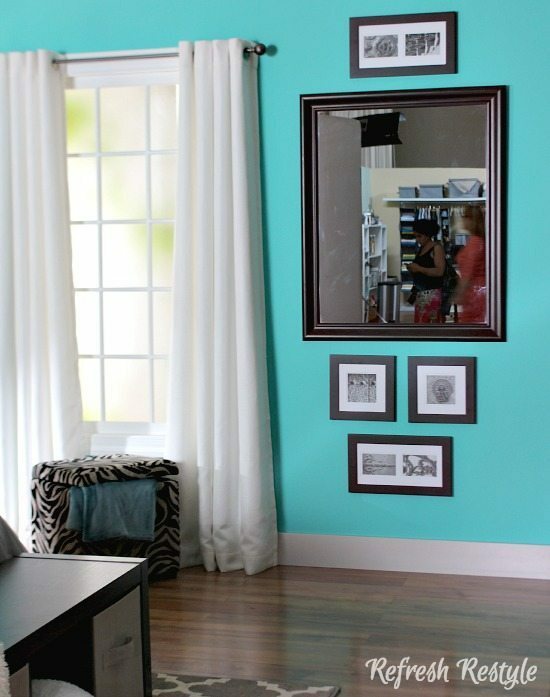 I love the idea of hanging photos above and below the mirror, just another designer idea from Better Homes and Gardens. 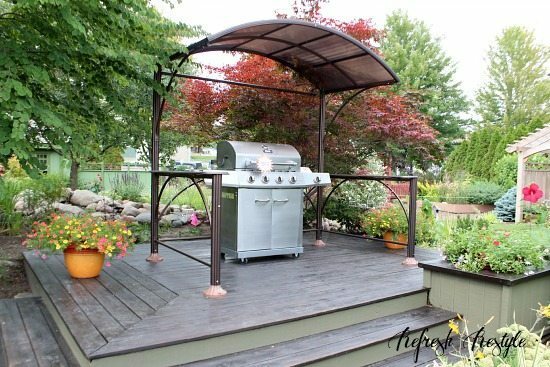 Grills and canopies, won’t this make grilling so much cooler. 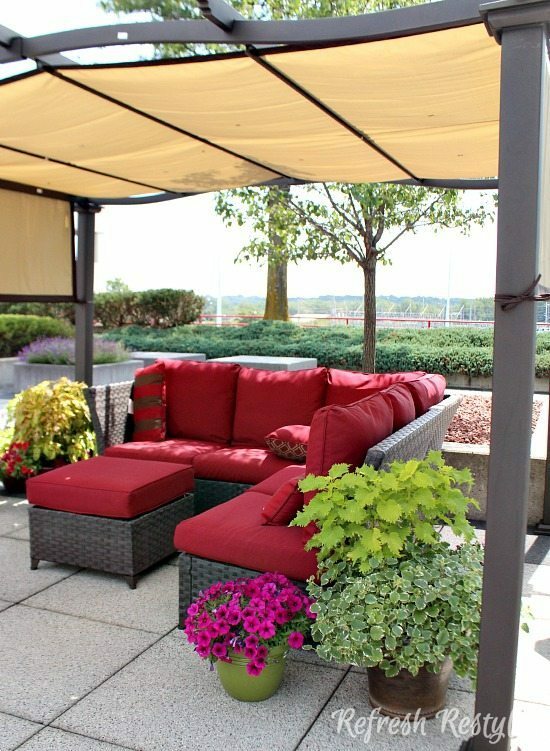 Awesome sectional and this canopy can be secured to your deck or patio. This sectional will be out in the spring, but here’s a beautiful Curved Sectional by BHG at Walmart! 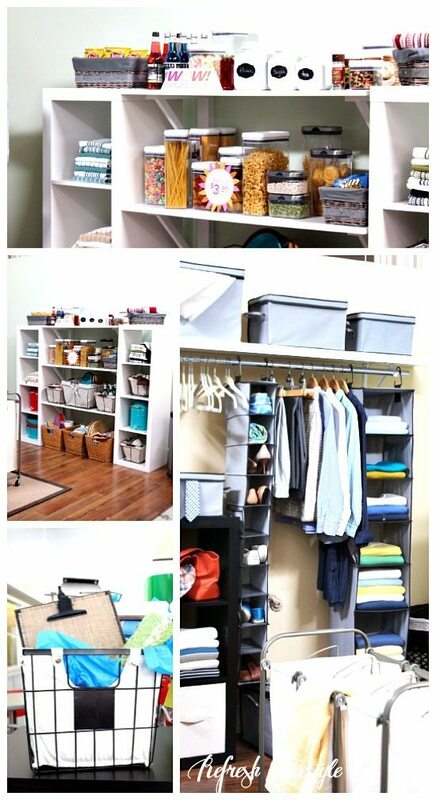 Storage ideas, baskets and bins. 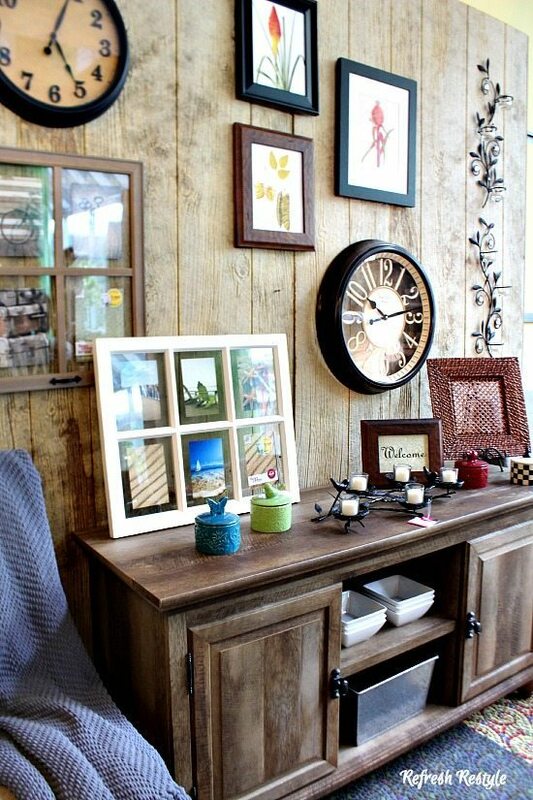 All affordable ways to get organized! And Laundry Baskets on wheels! We meet so many talented people. 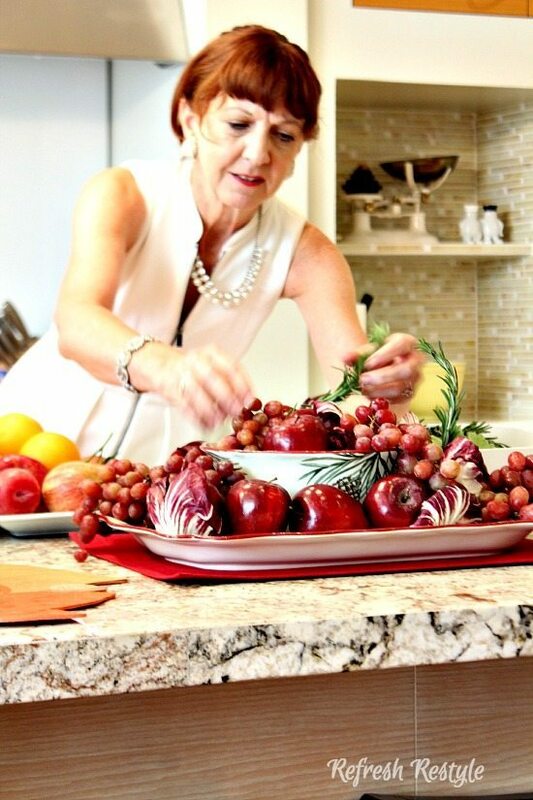 Nancy taught us three – 5 minute arrangements using a platter and a bowl. Celebrating three different seasons using what we already have. 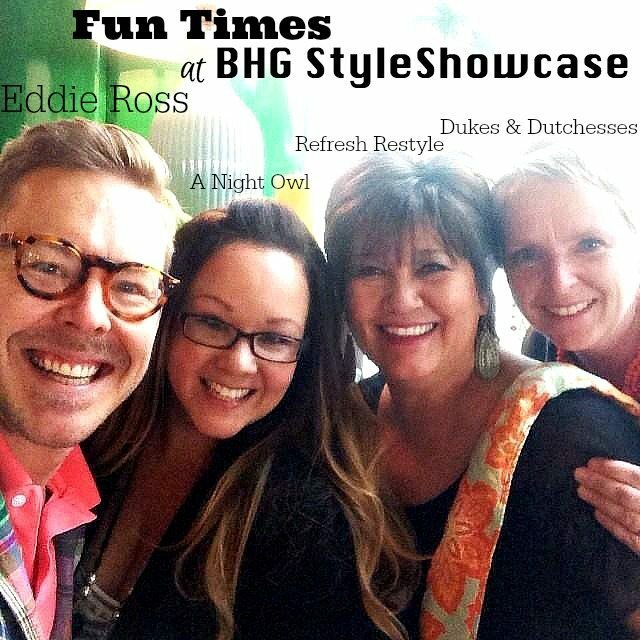 Here we are with Eddie Ross, East Coast Producer/Editor for Print and Digital for Better Homes and Gardens! It was like catching up with an old friend, even though we’d never met. So much talent and fun! Love him! I got to see so many blogger friends, we had a blast! Ideas galore! And I’ll have more. Y’all know I had to have three of those BHG Metal Buckets $12.44, the ones that look just like an Olive Bucket! 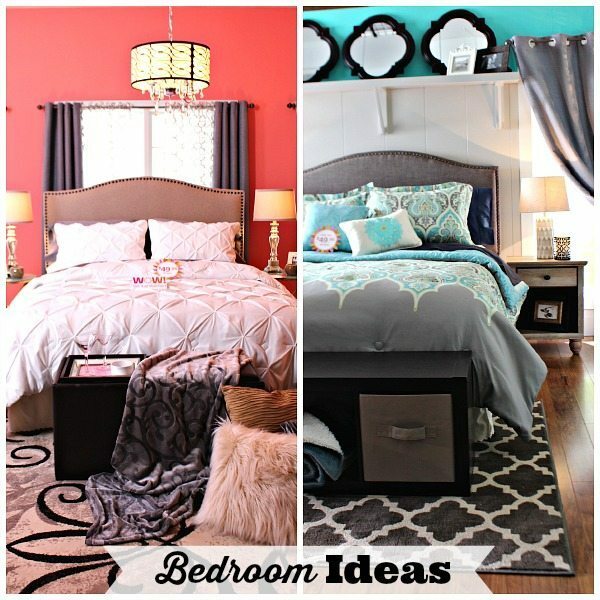 Where is the dark grey rug from ? 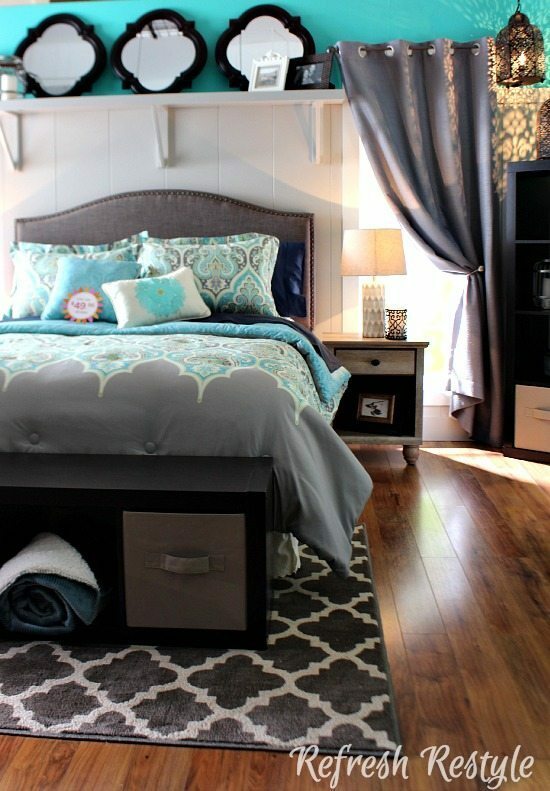 The dark grey rug is from Walmart. I love it, Field of Dreams! I was obsessed with that headboard as well. Beautiful & cost effective. Lots of pretty stuff in those photos, but the best was the pretty little lady we call Debbie. Debbie! Fantastic for you and lucky BHG & Walmart to have you around. 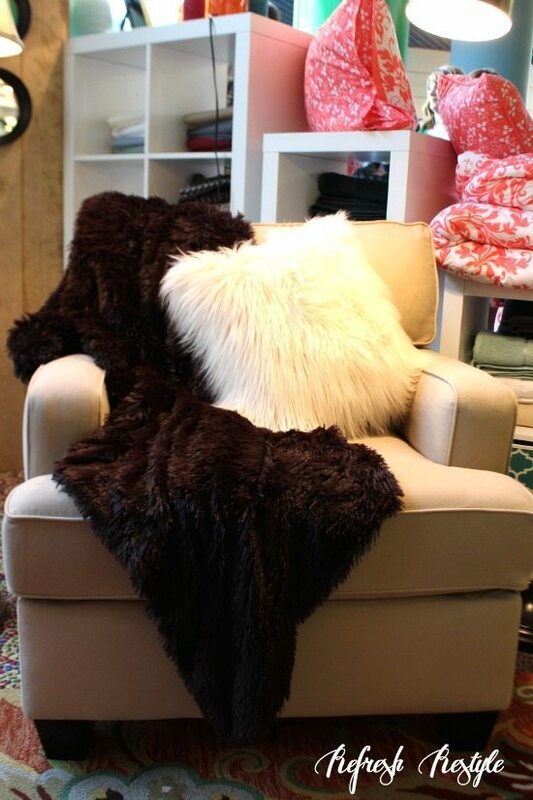 I am buying those furry/fuzzy pillows for my girl’s “Babe Cave”! They have been wanting them but others are so expensive. So thank you! WOW! I love everything here. Congrats on your amazing opportunity. What a wonderful trip! There are so many beautiful things I can’t wait to see them at WalMart! Thanks for sharing……..I am sharing your post today! Look at you, girl! How fun! Congrats on the great opportunity and the visit to the ICONIC Iowa State Fair! I love the new styles! Can’t wait to see it in person. I know, me too Brenda! Now I’ll be obsessing over those FOX goodies. You know I need them. You + BH&G must be magic, y’all are going to get me in WalMart! OMG this makes me want to sell everything in my house and start over with everything brand new. I can’t wait to see the coming post that you will have on your blog. BEAUTIFUL!!!!! I know you had such a wonderful time. You’re pictures are amazing! Great products and I can’t wait to see them! Oh wow! I’m so excited for you! What an awesome opportunity. Can’t wait to check out some of those products at one of my local Walmarts. 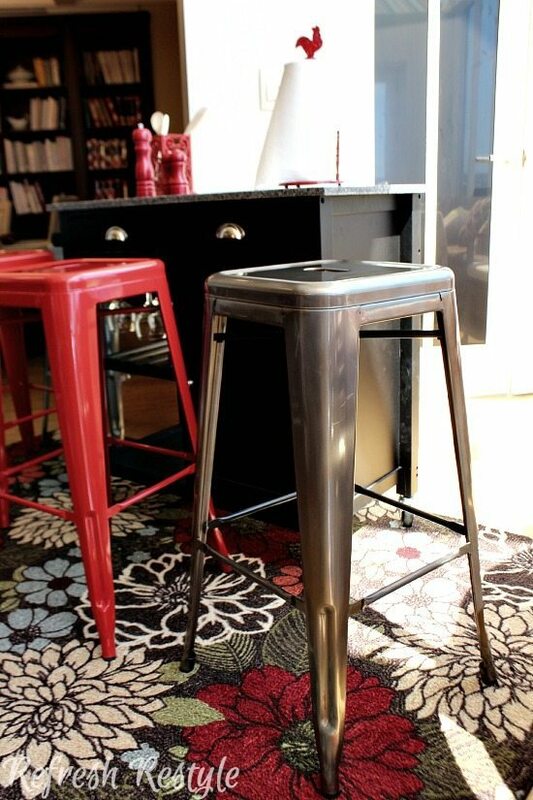 I hope I can nab some of those cool stools. Yes Melissa, go get you those bar stools! They are awesome! How exciting for you Debbie!!!! And so well deserved! Sounds (and looks) like you have a fabulous time! And I’m loving all those affordable BH&G offerings at Wal-Mart! how exciting. i saw those stools at walmart the other day but they didn’t have enough. can’t beat the price. 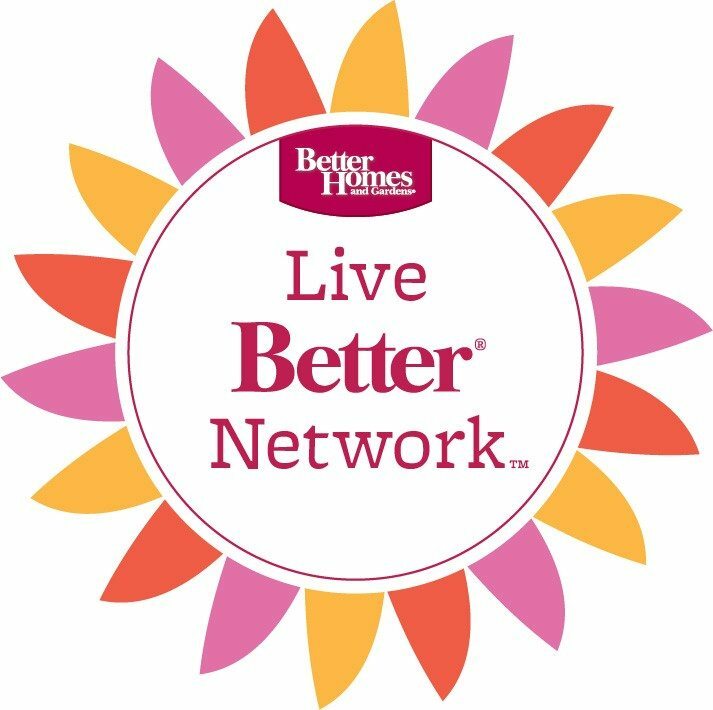 look forward to your tips and BHG adventure! So much fun! 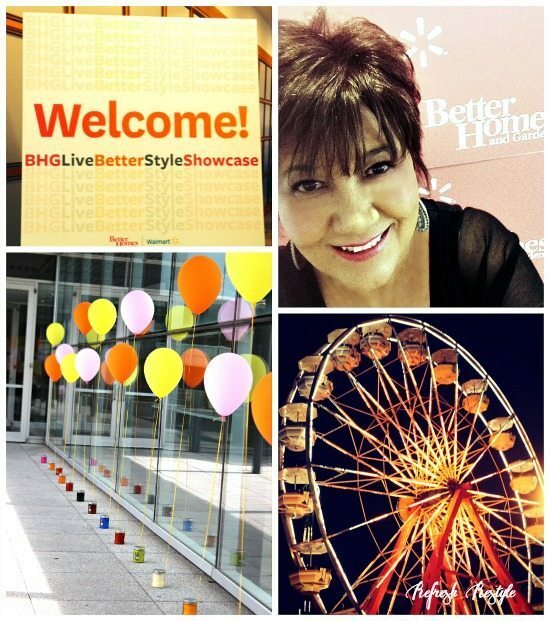 You are going to have a blast working with BHG! I love the Farmhouse Luxury – right up my alley! I know what you mean Karen! 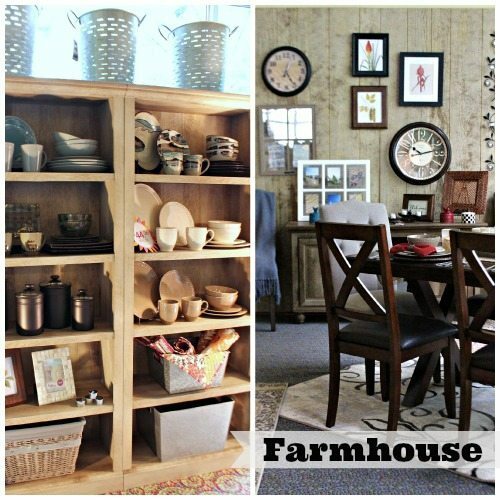 Farmhouse is my favorite too! What an exciting and fun opportunity for you! After seeing your pictures, I want to get in my car and head straight to WalMart. I see so many things that I adore and the prices are so reasonable.